The HD over IP w/ RS-232 and 2-way IR extends HDMI, RS-232, and bi-directional IR over a Gigabit Local Area Network. Resolutions up to 1080p Full HD and 1920 x 1200 (WUXGA), HDCP, Deep Color, 7.1 channel High Bit Rate digital audio, and Lip-Sync pass-through are supported. The Sender and Receiver units can be automatically or manually configured to unique IP addresses to allow the connection of multiple Senders and Receivers to the same network. Multiple Receiver units can simultaneously connect to any Sender unit within the network including the Gefen KVM over LAN products with HDMI, DVI, or VGA video, to create a virtual crosspoint matrix of just over 65,000 Sender and Receiver units total, depending on the network bandwidth and number of ports on the network switch (see Notes 1 and 2). IR control can be extended from Sender to Receiver and from Receiver to Sender, allowing the control of source units and displays remotely. The IR input ports on Sender and Receiver units can accommodate both the Gefen powered IR extender EXT-RMT-EXTIRN and electrical IR from automation control devices. RS-232 serial control can also be extended between each Sender and Receiver unit. The built-in web server interface makes control, set-up, and configuration simple and intuitive. When using multiple Senders and Receivers as a "Virtual Matrix", you can connect to any of the Senders within the network by accessing the web interface of each Receiver unit via a web browser on a mobile device or computer, or by using the Gefen KVM/Video over IP Keyboard Switching Controller software (available for download at www.gefen.com). The Gefen HD over IP extender is the perfect solution for large scale remote HD content access and digital signage applications. f you will be connecting multiple Sender units, use the built-in web interface to assign a unique channel ID to each unit. Use the included HDMI cable to connect an HDMI source to the Sender's HDMI input. Using the included mini-phone-plug-to-female-DB-9 adaptor, connect a DB-9 male-to-female RS-232 cable from the Sender unit to an automation control device. If IR extension between the local and remote locations to control the source and the display is needed, connect IR emitters (Gefen part no. EXT-IREMIT) (one included with Sender unit) to the Sender and Receiver units IR Out ports and attach them to the IR sensor lenses of the source and the display. Connect IR extenders (Gefen part no. EXT-RMT-EXTIRN) (one included with the Receiver unit) or electrical IR outputs from automation control devices to the IR In/Ext ports of the Sender and Receiver units. Using an HDMI cable, connect the HDMI output of the Receiver unit to your display. Using the included mini-phone-plug-tomale-DB-9 adaptor, connect another male-to-female DB-9 cable from the Receiver unit to the display or another RS-232 controlled device. Connect the Sender and Receiver units to each other directly or through a Gigabit Ethernet switch, using CAT-5e or better cables. Each cable run can be up to 330 feet (100 meters) in length. Connect the included 5V power supplies to the Sender and Receiver units and to available electrical outlets. Power-on all associated equipment. Use the Mode selector within the web interface to optimize the picture for sharper still images or smoother video motion. * Features and specifications subject to change without notice. Question: Hi, I'm wondering if you have any latency specs on the EXT-HD2IRS-LAN-TX unit, or what would you advise has the lowest latency (it is for a live video link of a speaker, so low latency would be preferred). Thanks! 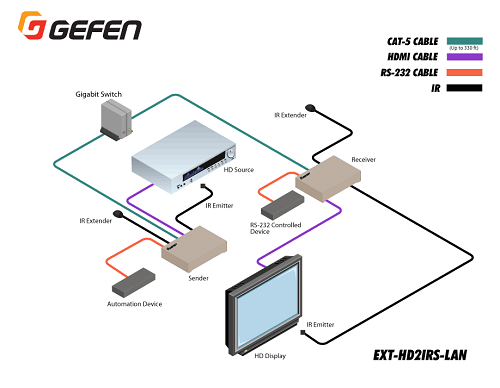 If IP / LAN connectivity is not required or desired, you may also want to consider the Gefen EXT-UHD-CAT5-ELRPOL, which features a little bit less latency; Most non-IP/LAN point-to-point KVM extenders, including the EXT-UHD-CAT5-ELRPOL, have a near-zero latency (less than 1 frame).